Photo by Jim Lennon. 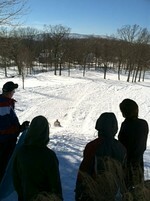 Sledding on Storm King Course, view from the top. The great outdoors called and residents answered by taking to the hills and links to enjoy snow recreation made possible by the recent stormy weather. 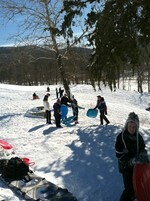 The Storm King Golf links and Moodna Railroad Viaduct landscape with gentle sloping unobstructed snow coated hills gave rise to a frenzy of outside activity that ranged from snowboarding, sleigh riding, snow shoeing and tobogganing, not to mention snow tubing, and from all indications participants had a great time!